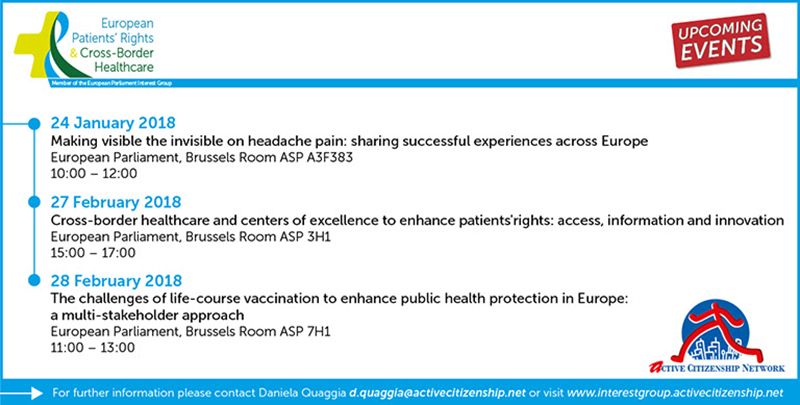 Upcoming events of the MEPs Informal Interest Group “European Patients' Rights and Cross-border Healthcare: Join us! Three new events of the Interest group will be carried out between January and February 2018 on three major issues related to patients' rights in Europe: Headache Pain - Cross border care and centers of excellence - Vaccination. Save the dates and register! "Making Visible The Invisible On Headache Pain: Sharing Successful Experiences Across Europe". (The programme will be soon available on this website). It will be hosted by the MEP Sofia Ribeiro in the framework of the MEPs Interest Group “European Patients’ Rights & Cross-Border Healthcare” . The aim of the event is to continue to explore recent achievements and good practices on the management of some primary headaches - in particular migraine and cluster headaches - across Europe, including non-EU countries and demonstrate what this community can offer in terms of raising awareness about the phenomenon, enhancing the body of knowledge of positive cases and successful experiences, and strengthening commitment to this topic. "Cross-border healthcare and centers of excellence to enhance patients'rights: access, information and innovation". It will be hosted by the MEP Patrizia Toia in the framework of the MEPs Interest Group “European Patients’ Rights & Cross-Border Healthcare” . After two years of campaigning to raise awareness on cross-border healthcare with its initiative “Patients’ rights have no borders”, Active Citizenship Network has decided to develop it further and plan a widespread activity focused on the European Reference Networks and on patients’ rights with regard to rare or complex diseases. "The challenges of life-course vaccination to enhance public health protection in Europe: a multi-stakeholder approach". It will be hosted by the MEP David Borrelli in the framework of the MEPs Interest Group “European Patients’ Rights & Cross-Border Healthcare” . Vaccination is one of the most important public health tools of the 20th century, however, vaccination programs are facing considerable challenges, such as a decline in vaccination coverage in some countries, the increasing cost of new vaccines and shortages in supply. In addition, misconceptions about vaccination can further shift the public focus from the individual and collective benefits of vaccination to increased distrust and fear of possible side effects. In this challenging and complex environment, there is a clear added value in involving all the stakeholders within the EU and in working with global partners to ensure the sustainability and effectiveness of vaccination programs.